In this lesson we’ll be clearing off the misconception of the relative minor key. If you’ve been around musicians for a long while, you must have come across the concept of the relative minor key; especially the common misconception out there. A good way to start this lesson is with an explanation of the concept of the relative minor key. …as its parallel minor key. Beyond the parallel relationship between major and minor keys, there’s also a relative relationship between major and minor keys. …are said to be relative keys because they have the same key-signature (sharing exactly the same notes). Relative keys share the same notes in common. Unlike parallel keys where the notes differ. …and they don’t have the same notes. …as its relative minor key. The relative minor key of any given major key can be determined by going down by a minor third or three half-steps from the first tone of the given major key. 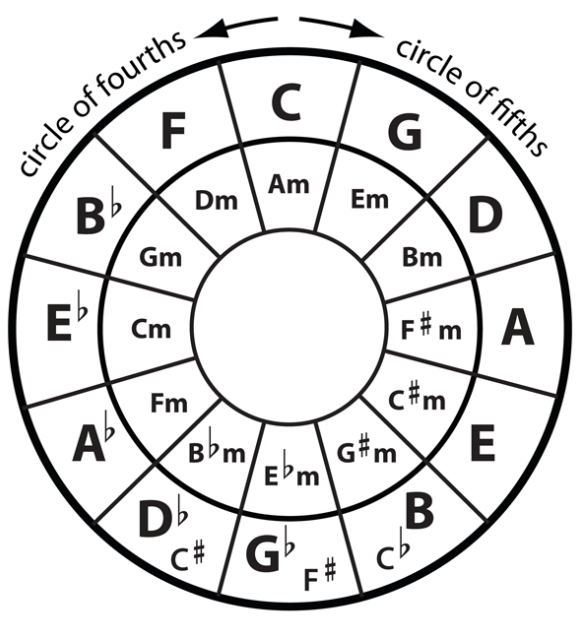 …which is a geometrical representation of the major keys and their relative minor keys. There’s a common mistake a vast majority of musicians make and I’ll be showing you that misconception of the relative minor key shortly. Instead of going down by three half-steps from any given major key, a lot of musicians actually go up by three half-steps to another major key. ….AND THIS IS TOTALLY WRONG! …and must always be a minor key. Going up by three half-steps to another key takes us into a related key and not a relative key. In a subsequent lesson, we’ll learn what related keys are and also distinguish them from relative keys. Thanks Onyemachi very well explained. Thanks for sharing this awesome wealth of information. Thank to Jermaine for all he does to help me be a better musician. You guys are the best. May God continue to bless you all. This is the best explanation of relative minor keys I’ve ever come across. When I read this again about how the notes are relative and looked at how they have the same Notes, it makes it very understandable. Thank you so much. I never understood it this way. You made it so simple. May God continue to bless you. Previous post: You Too Can Harmonize The Major Scale Like A PRO!!! Next post: Who Else Wants To Learn About The Chromatic Mediant Chord?